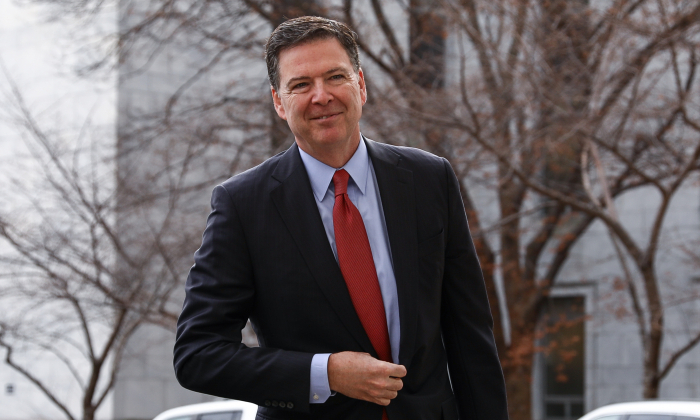 A federal judge ordered the Department of Justice to hand over memos drafted by former FBI Director James Comey in which he recorded the details of his one-on-one conversations with President Donald Trump. Judge James Boasberg ruled in favor of CNN, The Daily Caller News Foundation, Judicial Watch, and others in ordering the Justice Department (DOJ) and the FBI to turn over the memos to the court by April 1. The memos in question include those Comey leaked to a “friend” with the intention of triggering the appointment of a special counsel. At least one of the memos contains classified information, according to Sen. Chuck Grassley (R-Iowa). The New York Times published an article based on Comey’s leaked memos on May 16, 2017, a week after Trump fired him. Deputy Attorney General Rod Rosenstein appointed special counsel Robert Mueller the day after The New York Times article. Government watchdog groups and the media have been fighting to obtain the memos since their existence was revealed. CNN sued the FBI and DOJ on June 15, 2017, promptly after the government failed to turn over the memos via a Freedom of Information Act request. As recently as March this year, the DOJ has argued that the release of the memos would interfere with the special counsel investigation. Attorney General William Barr announced that the special counsel finished his investigation March 22, clearing the path for the release of the memos. Six of Comey’s nine memos have been released to the public but include redactions. The removal of the redactions could reveal which foreign leader called Trump first to congratulate him on the election victory, whether there was a Foreign Intelligence Surveillance Act warrant to spy on then-national security adviser Michael Flynn, and other items. A group of 11 House Republicans referred Comey for criminal investigation in April last year over the leaking of the classified memo. The lawmakers also accused Comey of investigative misconduct and obstruction in the Clinton-email probe, as well as lying under oath about his decision to exonerate the former secretary of state. Comey faces additional scrutiny from the Senate Judiciary Committee, which is delving deeper into the events that led up to the FBI obtaining a warrant to surveil former Trump campaign associate Carter Page. Comey signed off on three of the four applications even though the FBI was aware that the core evidence in the document came from an unverified dossier compiled by a former foreign spy and was paid for by the Clinton campaign and the Democratic National Committee.